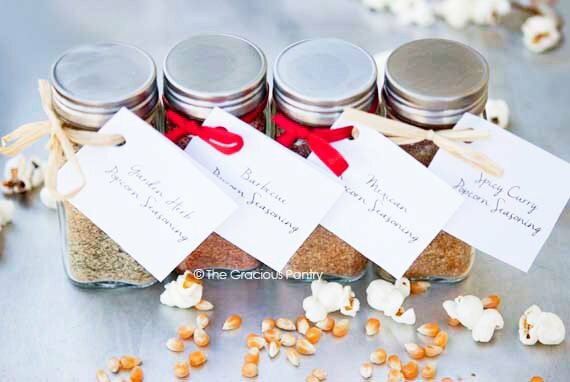 These clean eating popcorn seasoning recipes make the perfect holiday gift for the popcorn lovers in your life! I love giving food gifts for the holidays. They are incredibly personal because they are so customizable. They also happen to be affordable and always well received. 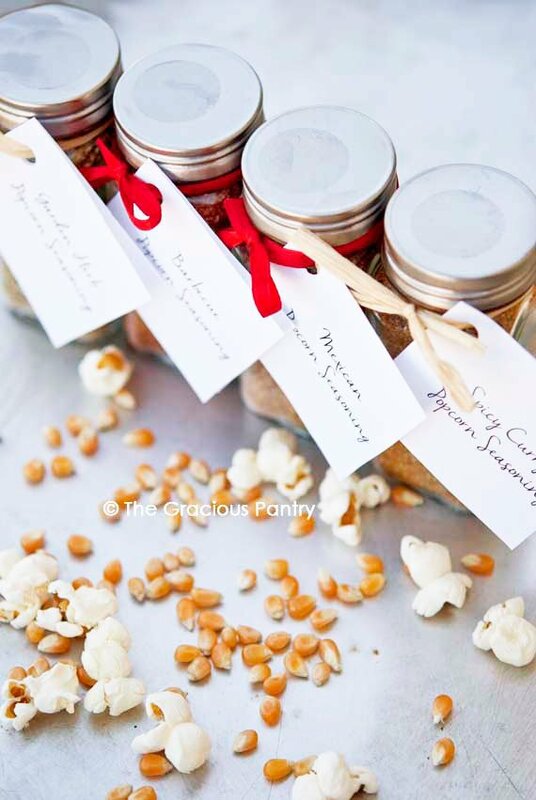 This week at The Gracious Pantry is all about holiday food gifts. Unique, always appreciated, food gifts. Popcorn seasoning is fabulous stuff. It gives you so many options for enjoying an easy-going night in with family or your significant other. We don’t own a TV at the moment, but some day we will, and when we do, I look forward to settling in with Mini Chef, a movie and a big bowl of popcorn for the evening. It’s such a fun way to spend time together. I had a taste tester for these recipes and she said that they were absolutely delicious. So you don’t have to just take my word for it. You get her word too! Bonus! You can sprinkle them on lightly for a delicate flavor or pile them on for a much stronger flavor. Whatever your taste buds prefer. Pop your popcorn, pour some warm oil or melted butter over the popcorn and then sprinkle a seasoning on as liberally as you like to taste. Toss popcorn to coat and enjoy! People always appreciate instructions, even if they are basic. The important part there is the oil or butter. These seasonings won’t stick if there is nothing for them to stick to. 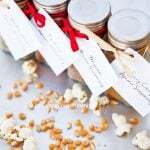 TO GIVE: If you can find a spice jar set that comes with a rack or basket, you’re set! Just wrap some clear plastic around it and include some popcorn to go with it. TO GIVE: If you need to put it in a box (not for shipping), simply fill most of the box with tissue paper, lay the bottles down flat with the labels showing on top, and then cover with a bit more tissue paper. Just be sure to include some popcorn, and if you’re really feeling generous, toss in a movie you know they’s like! TO SHIP: If you need to ship these, I highly recommend wrapping each bottle in bubble wrap separately. Include popcorn, and add peanuts all around to keep them from shifting. If you are tossing in a whole bag of popcorn, be sure to put it in a Ziploc bag in case the plastic package comes open en route. But regardless of whether the popcorn is in a plastic bag or a glass bottle, I recommend wrapping that individually in bubble wrap as well. This seasoning is best served with some parmesan cheese sprinkled on too. Each recipe makes enough to fill a standard spice bottle, plus a little extra. Measure spices into a small to medium mixing bowl and stir well to combine. Pour into spice bottle and label appropriately. Sprinkle over popcorn as desired. Please note that the nutrition data is a ballpark figure. Exact data is not possible. Data is for the entire batch, not for 1 serving. Serving size is up to you. Each recipe makes enough to fill a standard spice bottle, plus a little extra. Please note that the nutrition data is a ballpark figure. Exact data is not possible. Data is for entire recipe. Serving size is up to you. Please note that the nutrition data is a ballpark figure. Exact data is not possible. Data is for the entire recipe. Serving size is up to you. These recipes from The Gracious Pantry archives. First published 12/1/14. Thank you so much for these seasoning ideas! I’m always looking for clean ways to liven up my evening popcorn snack. Currently my favorite is air popped popcorn with a little melted coconut oil and a sprinkle of sea salt. My non-clean-eating husband and daughter even ask for it! Thanks again, I can’t wait to try these recipes! I want to try them all! They sound delicious! Would be nice gifts for the ladies at the office. What a unique and adorable gift idea! Thanks Tiffany, you really make clean eating enjoyable and fun! What a creative gift idea! I’d love to be on the receiving end of something like this! I just found our air popper again, and these look like perfect spice mixes to try! Thanks! Those all sound delicious! My son is always for cheese popcorn. Do you have any recipes for cheese corn? Do you by chance have a ranch version?